President Trump joked about Rep. Greg Gianforte assaulting a reporter back in May of 2017 during his rally in Montana on Thursday night. Gianforte body slammed and punched Ben Jacobs, a reporter for The Guardian, the day before his special election. He pled guilty to misdemeanor assault. “He’s so smart, you’re on live television all over the place, and we’ve had people get up [and] speak for 20, 25 minutes and these guys are going crazy, that’s not the deal. But Greg is smart, and by the way, never wrestle him. You understand – never,” Trump stated. “And he was way up, and I said this was like the day of the election, or just before, and I said oh, this is terrible he’s going to lose the election, then I said, ‘well wait a minute, I know Montana pretty well, I think it might help him,’ and it did,” the president concluded. 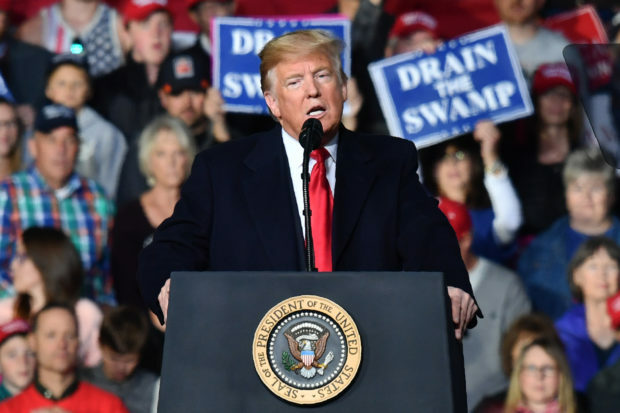 The president’s rally was in Missoula, Montana on behalf of Republican Senate candidate Matt Rosendale and freshman Republican Rep. Greg Gianforte. Rosendale is going up against Senator Jon Tester in a competitive race.